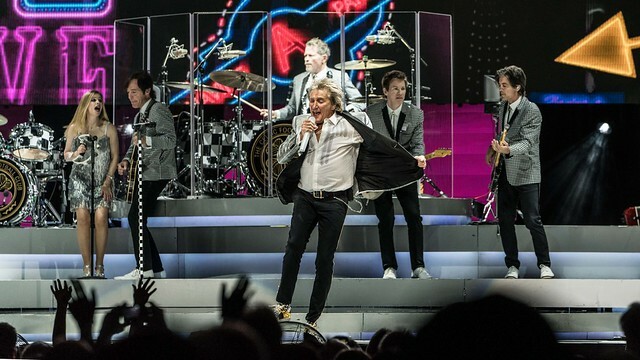 Saturday Night Party With Icon Rod Stewart In Charlotte Reviewed by Jimmy Warsham on July 30, 2018 . 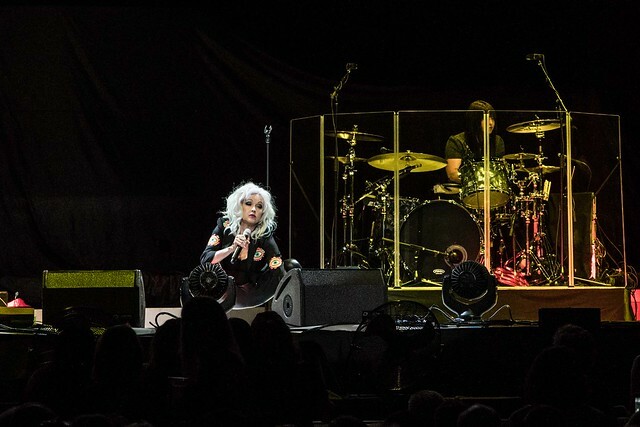 Saturday night brought two classic musicians to Charlotte’s Spectrum Center to kick off the weekend party uptown. 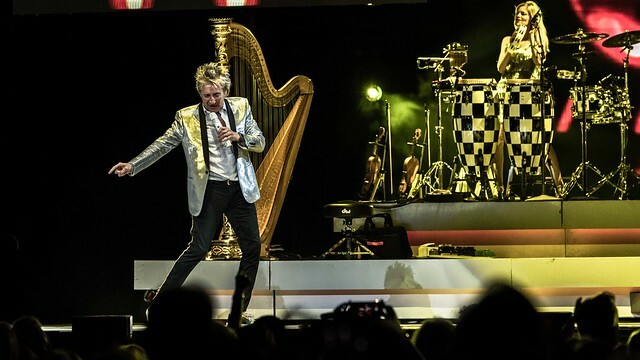 Still going strong 50 years after his initiation into the industry, Rod Stewart, with supporting act, Cyndi Lauper made a stop in the Queen City as part of their 2018 tour. The two icons will be touring together through the summer and wrapping up their shows up in Seattle on September 1st. There was certainly a mixed crowd based on age, but it more heavily leaned towards a more mature crowd. Rod’s appeal to the ladies is obviously still there based on the huge number of women who made the trip uptown. The men in attendance made this part of date night and had a lady on their arm. I would say that was probably a smart move gents! I am sure the rest of your weekend was a lot of fun. With the crowd not quite filling in the seats yet, clad in black leather, Cyndi Lauper opened the show in her own unique stylings. Her set leaned heavily towards songs from her debut album She’s So Unusual. 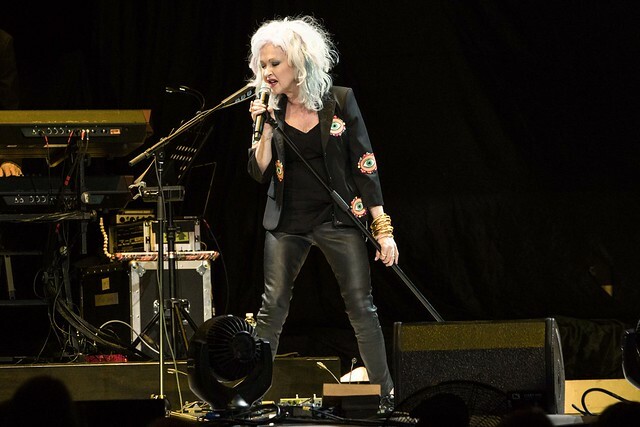 Cyndi looked great, and sounded flawless for the couple of songs that I did get to see her perform. I understand she did drip her political opinions, and I wonder if this is why the crowd made a slower entrance into the venue than normal? Since I can’t stand when people do this in a captive setting, I will not dwell on that to give it any additional credence here either and focus on her music, which I love. 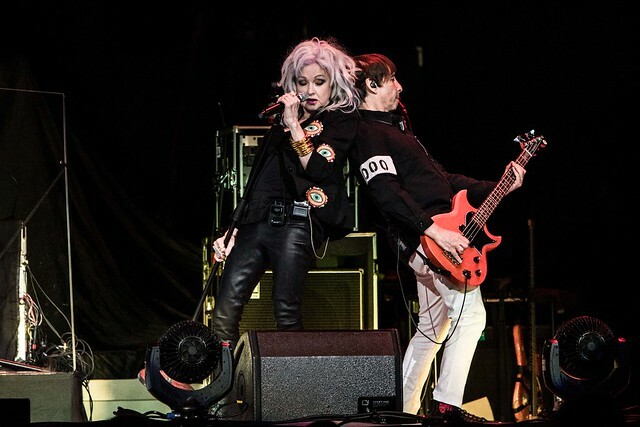 Cyndi still worked the stage almost as well as she did in 1983. Able to work the full length from left to right to get the crowd involved, Cyndi was on top of the PA system upside down doing some yoga style acrobatics with her head hanging upside down off the speakers. Hearing bits and pieces from our media staging area, she sounded great. I was able to see her in 1984 in Charlotte, on the 30th anniversary of the release of She’s So Unusual in NYC, and again now, and the music is still great all these years later. Rod Stewart has the full stage setup to give you a complete show. No expense has been spared to give you the full experience. 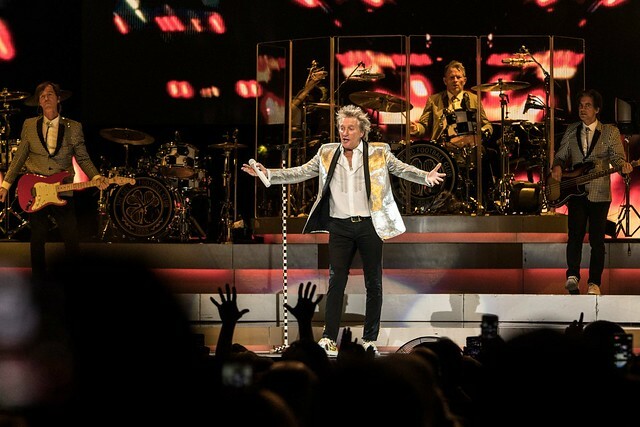 Lights, big screens, beautiful background singers/dancers, costume changes, and amazing musicians have been assembled to accentuate that signature Rod Stewart rasp and his extensive catalog of music. Once you get to this point in your career, I am sure it takes a lot of thought to put on a show like this. Where do you start when you have 50 years of work and about to release another record in a few months? Rod played as many of the hits in as he could and mixed in a few of the new tracks. His new album, Blood Red Roses will be the 30th studio album that he has release and will drop on September 28th. He gave us a taste with a few songs from the upcoming record, an upbeat number “Hole In My Heart”, and a more serious tune, “Grace”, that remembers lost love stemming from the Irish uprising in 1916 and the subsequent execution of one of the leaders, Joseph Plunkett. 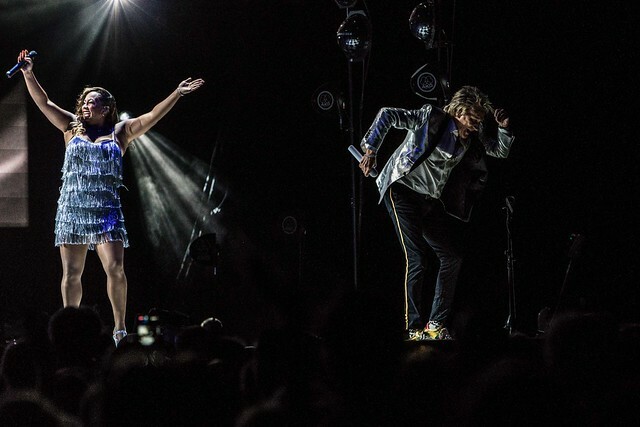 From the time Rod hit the stage, the crowd was engaged. HIs songs are such classics that participation was a mandatory activity. Everyone was singing along, including myself. I have been hearing these tunes since I was a very young child. My mother was a huge fan of his, and as a result, songs like “Tonight’s The Night”, “Maggie May”, and “Young Turks” are deeply ingrained in my memory. I have to say listening to the songs took me back to a past time that was very nostalgic for me and somewhat emotional to me. That is what music is supposed to do, and it did it to me. It did for everyone else in the building as well. Well, except for two young girls in the front row that Rod called out, mentioning that “they were so bored they were fixing each other’s hair.” The cameras panned to the two and confirmed that they did look bored for sure. The rest of the crowd was up dancing, hands twirling in the air singing along with the hits. The ushers, security and everyone else followed suit. Rod still has a hard time standing still for too long. His age may have slowed him down from where he was in 1981, but the heart is still there. He may be a little slower but he still is dancing and grooving all night long. He sounded great as well, but he clearly is battling a little cold or something as he had a tissue with him at times during the night. As the night was coming to a close, the building was filled with thousands of balloons and soccer balls were punted out into the crowd by Rod. Smiles and couples moving from side to side in unison while others were up dancing and singing like nobody was watching them. I just caught myself looking around at the crowd and feeling good about being there with this crowd. I think that’s the thing with where Rod Stewart is now. It is now feel good, music to a time when true singers and musicians actually performed themselves without all the technology that is in place for today’s musicians. Rod even made a comment about people “miming” their songs and how it is dishonest. I have to agree. Seeing these true performers is a treat, but they are not getting and younger. We will not have these people with us forever, so I was very thankful that I had a chance to see Rod. Get out and see these icons while you have a chance. 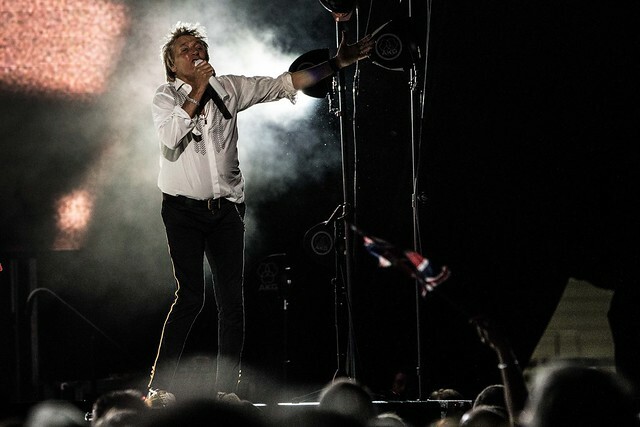 The tour will continue on until September, then Rod has some other dates to catch him throughout the rest of the year. I don’t always feel some shows are worth the money, but I left this show feeling that it was worth the price of admission.